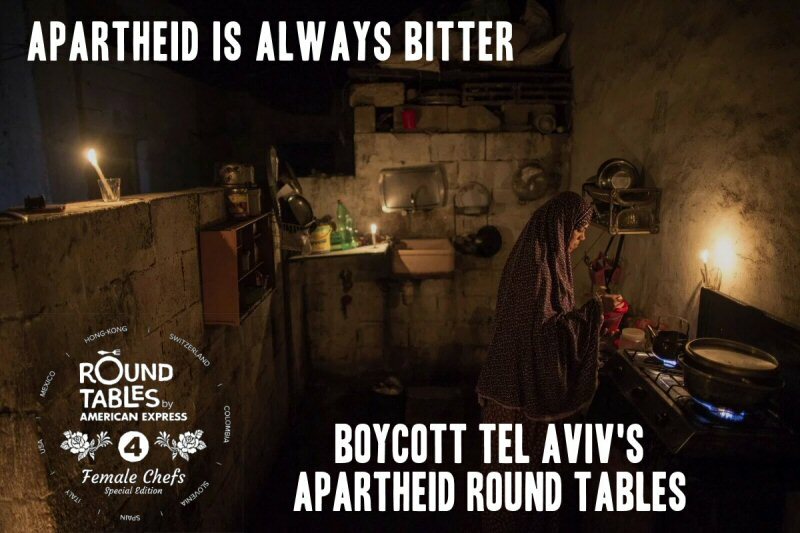 We, the undersigned workers’, womens’ and farmer’s associations, appeal to chefs to cancel their participation in Round Tables 2018, scheduled to take place in Tel Aviv from November 9-23. It is an attempt to whitewash Israel’s grave violations of Palestinian human rights. This year, the festival is using a feminist facade, through its “female edition” theme, to cover-up Israel’s decades-old system of occupation and apartheid. Palestinian women bear the brunt of of this system’s crimes and are doubly marginalized as a result. The festival is partnered with companies involved in grave violations of Palestinian– and Syrian — human rights. Golan Heights Winery, Dan Hotels, and Argal Services Company all operate businesses in or that serve Israel’s illegal settlements, built on stolen land. Such settlements constitute war crimes under international law. Via the BDS Nationial Committee.